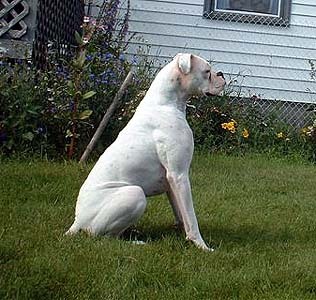 Riley's sire is the stunning, stallion of a dog, Am/Can. MBIS Ch. 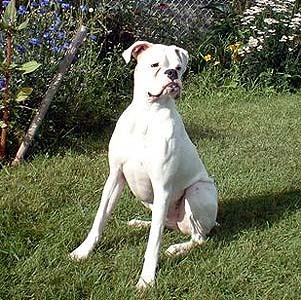 Summer's Dash Riprock SOM (Dash), who was sadly taken from the Boxer world much too soon. I am very proud to be able to say that Riley and his five littermates are a result from Dash's last naturally sired Canadian litter. I want to thank Josie and Tom O'Reilly of Summer Boxers (Reg'd) for allowing me to breed my Ally McBeal to Dash Riprock. The future looks very promising with Riley and his littermates. Keep checking back for updates on Riley as he grows.